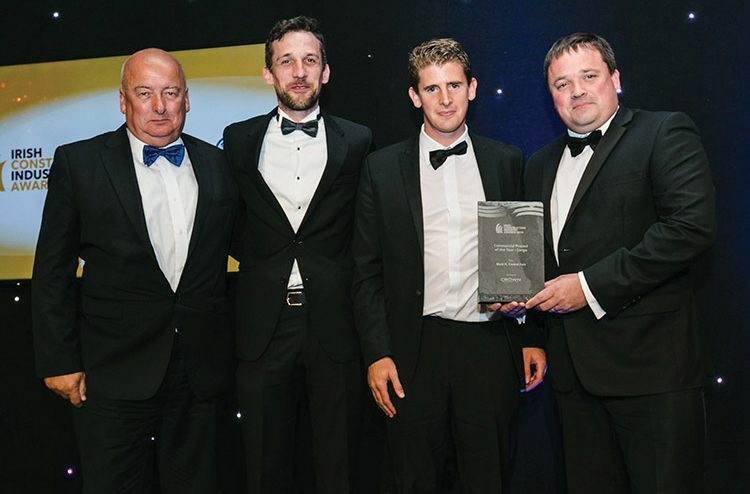 The fifth annual Irish Construction Industry Awards took place at the Citywest Hotel on June 14 last and what a night it was for Collen Construction who took home the awards for Commercial Project of the Year (Large category) and Retail Project of the Year. Since launching in 2014, the Awards has established itself as the benchmark for those demonstrating excellence and innovation in the Irish construction industry. Collen Construction won the Commercial Project of the Year (Large category) for its €41 million Block H, Central Park project in Leopardstown, Dublin 18, which was constructed between April 2015 and December 2016. The 208-year-old seventh-generation family-owned business also received the Retail Project of the Year accolade for its development of a new €10 million Audi Centre in nearby Sandyford. It was nominated in five categories and was delighted to be among the winners. Collen’s construction director David Lee and senior contracts manager John Sweeney, along with Graham O’Sullivan and Derek Casserly of project architects Henry J Lyons, were on hand to accept the Commercial Project of the Year award from Owen O’Gorman, managing director of Crown Roofing, who sponsored the event. “It was a great night,” says David, who has worked with Collen Construction for the past 29 years. “To come away with two awards was a wonderful achievement for the company. We weren’t expecting to win the Commercial Project of the Year award. Block H is out on the periphery of Dublin and was up against some prestigious projects in the heart of the city, so it was a huge surprise to win that category. Comprising a high-quality office headquarters, completed to full modern third-generation specification, the award-winning property extends to 27,000m2 including car parking. Specifications included floor to floor height of 3.9 metres, floor to ceiling height of 2.9 metres, structural grid of 7.5 metres, occupancy of one person per 10 square metres, tenant showers and changing facilities, fully landscaped roof terrace areas, high-quality common area finishes, strikingly finished façade of a mixture of granite and glass, high-speed passenger lifts over 11 storeys, raised access floors with floor boxes wired for power, suspended ceilings, recessed CAT 2 lighting and full air conditioning throughout. The 3-story basement required a deep excavation through 9m of rock adjacent to occupied apartments. During the deep excavation, vibration monitoring was installed to manage the vibration and movement of the area while the rock breaking was under way. Being mindful of the surrounding live buildings, Collen installed acoustic matts to the basement areas to prevent noise travelling through to the adjacent buildings. The team provided regular updates at meetings with neighbours. All rock broken on site was crushed and utilised in the fill which earned additional LEED points. The project achieved LEED Gold accreditation with Collen going above and beyond the standards necessary for this accreditation. The construction credits target was 11 however the project achieved 16 points, only 3 credits short of Platinum. The project received exemplary points for recycled materials and regional materials. The project undoubtedly demonstrates Collen Construction’s commitment to repeatedly delivering to the highest quality standards when you consider the excellent relationship with Client, Green REIT (Real Estate Investment Trust), which spans over 20 years. The new building was handed over to the client and has been leased to AIB for 20 years. During the build, David collaborated with Green REIT director Roger Semple as well as architects Henry J Lyons, civil and structural engineers Waterman Moylan, services engineers Axis Engineering and quantity surveyors KSN. Since completing Block H in Central Park, Collen Construction has moved on to Block I which is a slightly smaller building comprising seven storeys over a two-level basement. Works commenced in June 2017 and are due for completion this December. The client is once again Green REIT, who David and Collen Construction previously collaborated with on No. 32 Molesworth Street, Dublin 2 which involved the refurbishment and rebuild of a four-storey building. Collen Construction is one of Ireland’s top 10 construction firms with a strong reputation for building quality and excellence. The company – which had a turnover of €200 million last year – has successfully tendered and negotiated projects for a range of clients in the commercial, fit-out, bio / pharma, health, data, industrial, residential and civic sectors. Collen’s dedicated teams work closely with design teams providing a full turnkey service to the client as required. Its management team ensures smooth coordination of all aspects of the project, including mechanical and electrical services. The company’s ability to consistently deliver quality and meet client parameters has regularly led to a partnership approach on subsequent projects with the same clients. Headed up by Dublin’s 1983 All-Ireland winning football captain Tommy Drumm, who was appointed managing director in 2015, Collen employs 150 people directly, the majority of who work out of its Dublin office which is based on the East Wall Road. It also has offices in Athlone, Frankfurt and Stockholm. Among the contractor’s current projects are the extension and refurbishment of the Frascati Shopping Centre in Blackrock, the demolition and rebuild of Enterprise House, also in Blackrock, and the development of three large data centres in the Dublin area for two of the world’s biggest internet firms. In continuing to build upon relationships with existing clients, Collen has expanded operations within mainland Europe to deliver the same first-class standard of projects that it has delivered in Ireland.